During the more than 50 years that he has worked as a professional journalist, Ted Koppel has embodied the term “eye-witness to history.” He covered John F. Kennedy’s funeral in 1963 and Barry Goldwater’s presidential campaign in 1964. He reported on Martin Luther King Jr.’s civil rights march from Selma to Montgomery, Alabama in 1965. As an ABC News war correspondent, he covered a succession of ten conflicts beginning with Viet Nam, Laos and Cambodia in 1967, ’69, ’70 and ’71 and finally as an embedded correspondent with the 3rd armored infantry division during the invasion of Iraq in 2003. He reported on Richard Nixon’s historic visit to the People’s Republic of China in 1972 and in 1973. In 1974 he was there for Henry Kissinger’s shuttle diplomacy in the Middle East. Koppel was with Mikhail Gorbachev on the last day of the Soviet Union and he was the first journalist to interview Nelson Mandela upon his release from 27 years in prison. 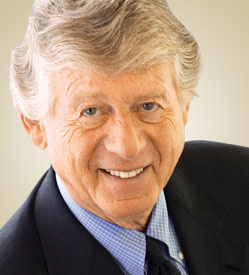 Over the course of 26 years as anchor and managing editor of Nightline, Ted Koppel became the longest serving news anchor in U.S. broadcast history. In 2012, New York University named Koppel one of the “100 outstanding journalists in the United States in the last 100 years.” When he left ABC News, he was the most honored reporter in that network’s history, having received more “Overseas Press Club” awards than the previous record holder, Edward R. Murrow, and eight “George Foster Peabody” awards. TV’s equivalent to the Pulitzer Prize is the Columbia-DuPont award. Koppel has won 12 of them. He has also been awarded 42 Emmy’s, including one for lifetime achievement. And he’s still at it—Koppel’s most recent book, a New York Times best seller, Lights Out, examines a threat unique to our time and evaluates potential ways for America to prepare for a cyber-catastrophe. Koppel serves as a commentator and non-fiction book reviewer for National Public Radio. He is also a contributing columnist to The New York Times, The Wall Street Journal and The Washington Post. As of February 2016, Koppel has undertaken a new assignment for CBS News as Senior Contributor to the CBS Sunday Morning Show.